I have my system built but I need some guidance on where to buy inexpensive grounding lugs and the best way to ground the panels, mounting rails and maybe my support base. If this is the wrong place to post this please let me know or move it to the correct location. A little background info, I have a 3500w solar array with a 5k grid tied inverter. I done this system on the cheap and have it all completed except for grounding the panels, installing a DC disconnect switch and buying my solar warning labels. Any help would be great on any of these items. I have found some grounding lugs for as cheap as 59c to 95c each, depending on the screw, the cheaper one is a steel screw for 59 cents, the more expensive one has a stainless steel screw. What are you thoughts on using one versus the other. Also have you heard of another cheaper price for the lugs? I haven't spent any time looking for a DC disconnect switch, so if any of you have any ideas for one of those, that would help as well. Lastly, the warning labels, I have found them at several web sites but they come in 10 each per package or a roll and I only need 1 or 2 of each label, any ideas? Thanks everyone for any ideas you are willing to share. Since I made this post, I have found the warning labels I need. Was hoping for someone's thoughts on the grounds lugs, if using a stainless steel screw vs a plain steel screw would make any big difference. I realize that steel will rust faster than stainless steel but what matters IMO is if it will provide a good ground. IMO, unless you plan on taking a system apart for some reason, it likely won't matter but I'm not sure. Thoughts? A belated welcome to our forums. I've no direct experience with grounding hardware but remebered this video from a while back. Maybe it'll be helpful. Thanks for the welcome and the youtube video, I have viewed that video already, it was where I learned what the cheaper grounding lugs look like, before I saw that video, I figured I'd need to buy the more expensive copper lugs. Right now I trying to decide if I can buy the cheaper type locally and that is what I'll likely do unless I can get small quantities shipped for free. Most ground lugs come in a package where you are required to by a 50 or more to get that great price, but having half a package of extra lugs just laying around will not save me $$, so I might just buy the more expensive ones, still doing the research. I started this project in late Feb by cutting down some trees that would cover my panels, then started researching, to find out what I needed. Lucky for me, a guy in my neighborhood had just done a similar project himself and I learned just about everything I would need from him. Found my 285w panels at a place in Fl where I was able to buy them for 59c a watt and only $759 for a 5000w inverter. Most of the hard stuff is done now and it looks like I'll be able to keep the cost below 4k. Compared to a system another neighbor paid 25k to have installed, I feel pretty happy about this so far. 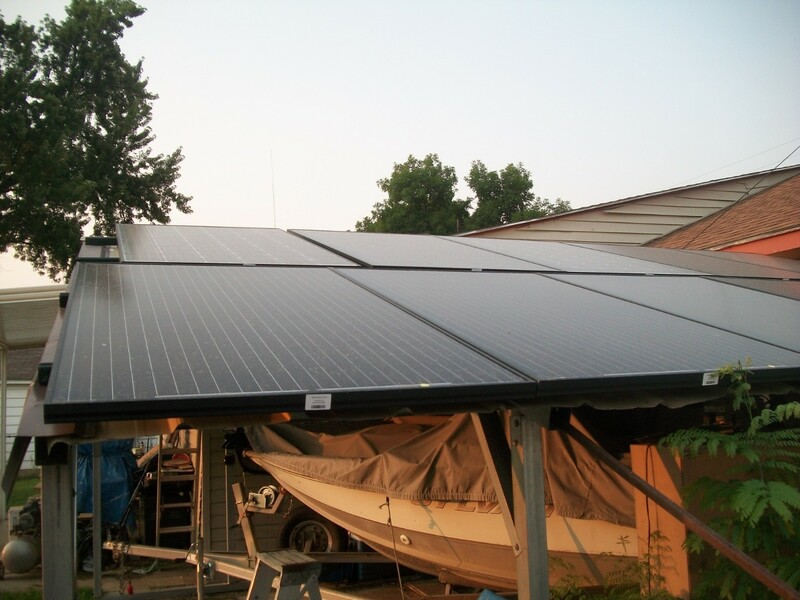 Instead of putting this system on my house roof, I put it on my steel boat canopy, I know I need to ground the solar panels but it also looks like I should ground my canopy just to be on the safe side. What I'm really not sure about is if I could just ground the canopy, instead of the panels too. Here is my reasoning, the solar panels are connected to a steel rail, that is bolted to the steel canopy, seems to me that everything is already connected, except for the ground. Might be time to go and talk to my building inspector to see what he thinks. 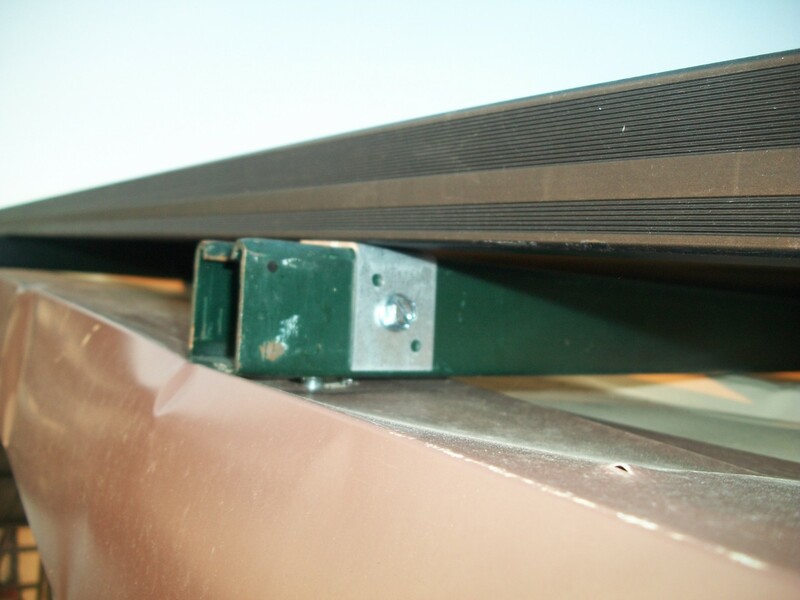 Code requires grounding the panels as well as the racks. I drove an 8' grounfd rod under my array, and ran #6 bare copper solid wire thru all the panel clamps, one end to the ground rod, clamped to the rack, and ending in the combiner box. Thanks you so much for the reply, looks like we have a similar setups. Maybe you can answer this question, what gage copper wire did you use to ground your panels? LOL, my bad . Here is a pic of my setup, I have a steel canopy, with a steel U channel rack bolted to it and the solar panels bolted to that, I took a reading with my ohm meter, it showed 0 resistance, so I just figured with everything connected together like it is, the only thing I needed to do was ground the canopy and the inverter. Your setup is a little different in that regard, so I can see why you would need to ground all the panels and the racks. You could be entirely right, guess my local building inspector will tell me for sure. I got my warning labels today so I'm just waiting for one more part before I can call him in. Maybe I should just send him these pics, instead of waiting until he comes over, then I will know for sure. Building codes are different in many areas but if I have to do it I will. If I connect the entire solar array, I will need about 52' of that copper cable. So I passed the inspection and now I'm waiting on the power company to come and install my new grid tied meter. I do have one last question for those of you that ran & hooked up your own wiring. In my inverter, where the wires connect, then run to my AC power panel, I have 4 sockets for the wire, N, L1, L2 and PE. I know N is neutral, L1 is line 1 and L2 is line 2 but does anyone know what PE is? I'm guessing it is the ground but I'm just not sure, the inspector thought I was right but I was hoping you folks here might know. Any ideas? "The Europeans use the term protective earth (PE) terminal instead of equipment grounding terminal."